Those who are planning to buy a OnePlus One, here is a good news. Earlier we posted that OnePlus Two will be released on June 1, 2015, which was a wrong news. 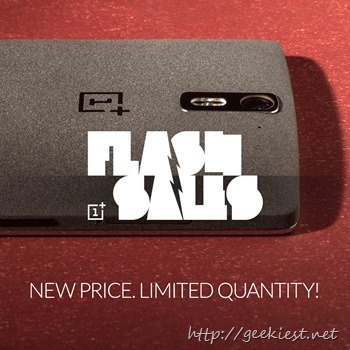 The teasing image was about a Flash sale of OnePlus one for a New price and for a limited time. We seriously believe that The OnePlus Two is really close, after seeing this promotion. This promotion is not available in India, while OnePlus Confirms that Indian users will get a special promotion sale soon. The new Price will be $249 for the 16GB Silk white variant and $299 for the 64GB SandStone black version.